Mark this one under “summer daydream.” The fine friends at http://www.hailtopurple.com/ are always one to take deep dives to a level that I can’t touch. Whether it be history, traditions or stadium trivia they are the goods. Then, an LTP reader sent this post along and I couldn’t resist sharing the diversion of fun time it gave me to not only think about, but actually visualize what an on-campus football stadium would look like. 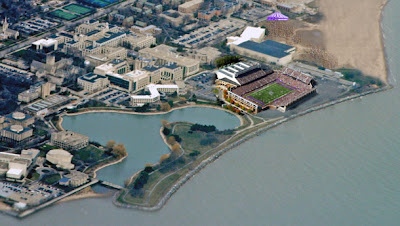 GoUPurple took the liberty of actually taking the daydream part out and created an actual graphic overlay of what a football stadium on the site of the current lacrosse stadium site would look like. Can you imagine how amazing that atmosphere would be? It’s like Army’s stadium, but on Lake Michigan. Talk about home field advantage! The student section would be insane, the tailgating would be phenomenal and the television visuals would be a 3-hour infomercial. Oh to dream…I’m fully convinced we need a completely new stadium – I’ve officially done a 180 on this topic. The feasability of this being built on the lake likely would have the environmental police opening up an office in the parking lot. It’s not going to happen. But wow…to dream. Well done HTP! Please take a fun tour down daydream lane at this post on HailtoPurple. This entry was posted in Ryan Field, stadium profiles. Bookmark the permalink. What a horrible idea! You guys are both nuts! >HTP concluded with: …just take a second to imagine walking into the lakefront stadium and taking in that view. Attendance would take care of itself. I imagine walking into the lakefront stadium on a cold, overcast, windy day with the realization that I'm about to feel absolutely miserable for the next 3 hours for a sparsely attended game. A shiny new stadium won't be any more impressive than the old one if it's half-empty. Ryan Field has charm. Sure, renovations are needed, but really, it's only lacking people and hotdogs (and perhaps a designated "No Standing" section, which would certainly be a hot ticket among those who sat behind me last year). >Three years plus of daily posts on NU and you just realize I'm nuts now??? >I'd rather see a 7,000-seat basketball stadium and performance venue on campus, opening up space on Central Street for more tailgating and perhaps a new football building. An indoor stadium next to SPAC could be spectacular, and it would be much more useful year-round. >This probably will not please the masses, but that's exectly where to the new Kellogg building is slated to go. >Upon further review, doesn't seem this is a realistic depiction – and I think the Kellogg building is supposed to go farther north by the parking lot NW of SPAC. The city/state likely would never grant the permits to allow it to be built there and it would make an already difficult parking situation worse. Also, it would cost a ton of money which would be more wisely invested elsewhere. And, the biggest issue, is that a new stadium or stadium renovations itself will NOT bring in more fans. I should expound upon this at HTP since I have some data to back this up. In any case it is a very nice thought experiment and it has obviously stirred the debate, which isn't a bad thing. >If and when time machines are cheap and reliable my first trip will be back to the 1920's to advise William Dyche that he look to the lakefront for a site to build a football stadium. Until that time I suggest we keep the discussion to matters that have greater than an infinitesimal chance of ever actually happening. I've wondering the same thing ever since I did a report on Dyche Stadium in 7th grade. As I remember the reasons for the current location were nothing more than the land was cheap and available. Of course the campus looked much different back then- and he probably didn't have the foresight to know how valuable a lakefront stadium could be nearly a century later- so trying to find a location on campus might not have been possible- or important. The new Kellogg building is supposed to go directly east of SPAC- where the parking lot and beach meet in the depiction. >can you imagine how TERRIBLE our campus would look after iowa and ohio state played there. have you walked around evanston after iowa and ohio state games, there is trash EVERYWHERE! especially in their "tailgating zones"
>In an ideal world I'd love a lakefront stadium. After all, the lakefill is my favorite place on campus year round. However, a basketball arena on campus would benefit the basketball program more than a football stadium would benefit the football program. Student attendance would go up significantly. >Well, well, well, aren't we a little group of Northwestern Wildcants today? Would a lakefront stadium be too cold and miserable? Of course it would, which is why they built Soldier Field so many miles from… oh, wait. Nevermind. Look, there's no point in debating the pros and cons of this idea, because, as @MBM points out (and I mention in the original article), NU's plans for that part of campus are already set, and the cost of doing a lakefront stadium are out of NU's reach. As someone pointed out on the Rivals message board, NU can barely afford to repave the west lot at Ryan Field. The lakefront scenario was just for fun. One serious comment, however, that I'd like to make concerns the issue that @jhodges brought up: why did NU put Dyche Stadium on Central Street in the first place? The Stadium was built there because the previous stadium– Northwestern Field– was built there in 1905, and in 1925 (when Dyche's construction began) it was the most efficient use of space. Northwestern Field was built on Central Street, away from the main campus, because the university had already allocated that area for future athletic use. Why? well, NU received a nice sum of money from the Chicago and Milwaukee Electric Railroad to do so. The rail line ran along Central Street, and in 1900 that was, by far, the easiest way to move fans to and from the stadium. Thanks for the info on why NU Athletics ended up on Central Street. I hope we got some good money from the railroad. Maybe we should bring back a Central Street electric line. That would alleviate some of the traffic issues.